Does anyone have dimensions for the ROTS boxes? The larger one appears to be narrower than the Original trilogy ones! Or even how wide the leather belt is, should be able to work out dimensions from that? 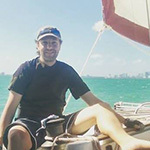 1.There are 10 large blocks and 9 small blocks. ◦The small coin-shaped item is 1.1811 inches (3 centimeters) in diameter. ◦Large block: 1.9685 inches (5 centimeters) by 3.1496 inches (8 centimeters). ◦Small block: 1.1811 inches (3 centimeters) by 3.3465 inches (8.5 centimeters). 4.The blocks are allegedly old aluminum project/science experiment cases from Radio Shack. These items are discontinued. 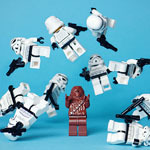 6.Chewie wears the bandolier on his left shoulder with the pouch resting on his right hip. 7.There is a hidden strap that attaches to the bandolier at the shoulder and goes around Peter Mayhew's neck, to keep the bandolier in place. 8.The Revenge of the Sith pouch appears to be made of cloth and not leather. 9.The Revenge of the Sith bandolier doesn't have the leather concho/checker piece/coin like the Classic Trilogy bandolier. 10.The Revenge of the Sith bandolier has some border lines in the both the main strap and the center strap. There are also some small leather loops on each side of the block that are probably for holding the center strap to the main strap. 11.The Episode 3 bandolier has blocks without any lip, and they look like they were assembled kind of like a 3D puzzle. 12.The bandolier used in A New Hope and Empire Strikes Back has simple tapered ends at each end of the strap. The Return of the Jedi bandolier has a curved, more ornate taper. CBlack. Those are OT boxes. The PT boxes like Dougie Fett is doing is totally different. I designed them in Via Cad and had them rapid prototyped. The prototypes are currently sitting in Rebound 25. Once I get the mold done and the first set pulled I'll post pictures. Then I guess we should maybe add those to the resources page?? I was hoping you'd say the belt was 4 inches, I based most of my calculations on that. Yeah, I'm planning on working up a Tarrful Resource page, but I'm waiting till I have made mine, partially to include pitfalls, but mostly because I have a hard deadline to be done by and I am trying to focus my effort on that. Just looking at this again, if the belt is 4 inches then the boxes must be the same, well near enough. 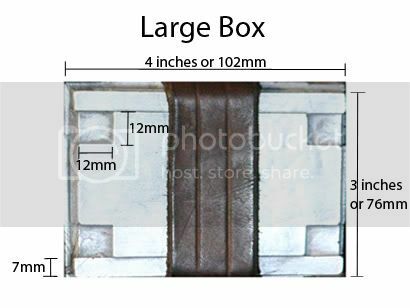 You're saying that the face of the large box is 84mm, that's 3 3/8" , I think it should be closer to 4" or 100mm. Here's the calculations that I made. 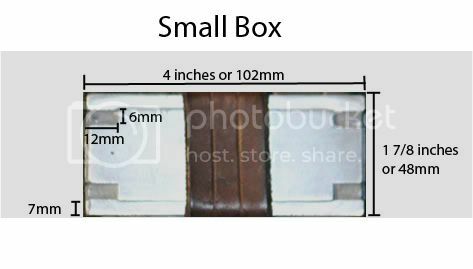 The small box is probably slightly longer maybe 105mm i think! Let me go back to my initial notes. At one time I had calculated using 3.75" bandolier width, then when back and did it for 4". I thought I updated my livejournal, but I might have the wrong one up there, unfortunately my notes are at home. That about what you are getting. Ok, I revisited this in more detail this weekend. My current belief is that Chewie's strap is 3.75 inches and Tarrful's is 4 inches. Now I might be off on this, how did you calculate the width of the strap? I'm still trying to thrash out the dimensions, have made a large box based on the measurements so far but not entirely convinced. I have a few pics of Chewie and Tarfful together and the boxes do look the same size. Yes, the boxes are the same, but Tarfful's straps are longer. If you look closely, he ROTS straps have a set of lines the run down them near the edge. 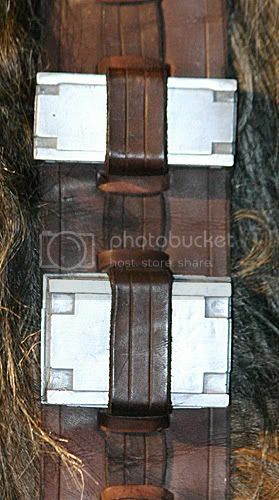 The large box completely covers Chewie's strap but only goes from one line to the other on Tarrfuls. I based my box measurements mostly on Chewie's bandolier. Ok, scrapped the previous work and went back and regenerated the calculations. I calculated Tarfful's bandolier at 4.5 inches, so Chewie's strap is probably 4 inches. Sometimes I hate playing picture math. So, what was ultimately determined about the width of Tarfful's bandolier? my name is tim bremer i am a member of the 501st and decided to work on a rots costume some years ago and have been working on my rots bandolier before i move on to finish the head for submission. i made my prototype boxes from the 4inch size that i saw on the web site mentioned here, can anyone tell me if the RL has adopted these sizes as the standard for the costume?? i would appreciate any help you can give.